Smelling a crayon is one way to change your attitude, Randy believes. It helps bring you back to your childhood mindset and it can often help you get in touch with what your childhood dreams were. Reconnecting with childhood dreams can help you bring them into focus in your current reality. Koltun, Moe. 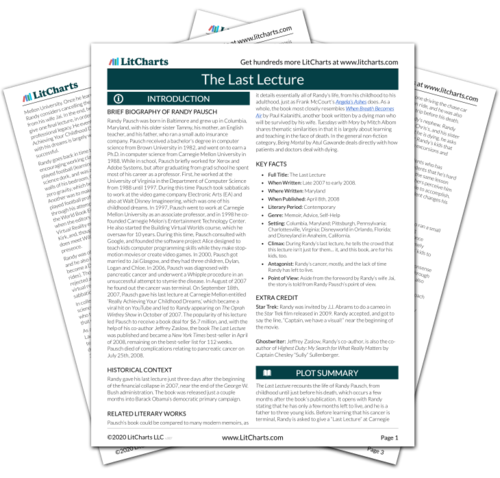 "The Last Lecture Chapter 49: Get In Touch with Your Crayon Box." LitCharts. LitCharts LLC, 26 Feb 2017. Web. 23 Apr 2019. Koltun, Moe. "The Last Lecture Chapter 49: Get In Touch with Your Crayon Box." LitCharts LLC, February 26, 2017. Retrieved April 23, 2019. https://www.litcharts.com/lit/the-last-lecture/chapter-49-get-in-touch-with-your-crayon-box.